EXCLUSIVE Set Report! Sneak-Peek! IT’S ANCHOR TIME! 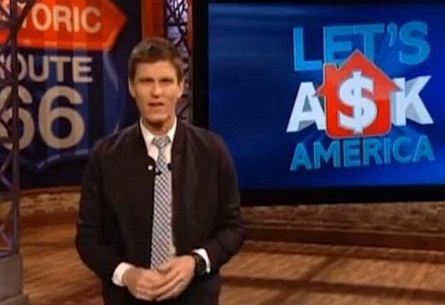 New game show, “Let’s Ask America” where contestants play via Skype from their home (or sometimes work) to a studio audience and game show host, Kevin Pereira (Attack of the Show, Viral Video Showdown) has winners walking away with thousands of dollars without having to leave their house or office! 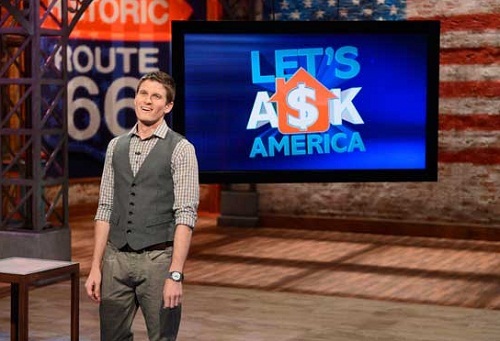 In two upcoming episodes, “Let’s Ask America” will have two news themed shows where all four of the contestants are news anchors from various cities including Kansas, and another themed episode with news weather reporters. They are all playing for charities. One anchor person played for a children’s charity, and another one played for the Humane Society. Two news anchors were tied at the end of one round. In the tie-breaker game called “Dash For Cash”, a trivial act is called out by the host that the two contestants must perform in front of their computer cameras in order for viewers and host to see. Whomever can achieve the task the quickest, wins the round and go on to play the next round. In the last example of “Dash For Cash”, a news anchor misunderstood the “Dash For Cash” task and thought that instead of writing just the words “weather” on a piece of paper and saying “I’m under the weather,” she thought she had to write out the whole sentence. She did this task from the desk that she was seated at in front of her Skype camera. Her rival had to get the paper and pen from another room. By the time she finished writing, her opponent finished the challenge ahead of her. She was visibly upset by the mistake which led to her elimination. The players are given multiple choice answers in which they must select the correct choice in opinion after hearing the question. Some choices and questions included: The residents of Florida would say that which one of the flowing in their state could cause major damage- a) a Hurricane, or b) a politician; What would husbands say they’d like to see updated the most in the bedroom – a) drapes, or b) carpet. If a contestant wins a perfect score in all rounds, then they earn $10,000. If in the final round they choose to gamble that amount for a chance to increase it five times, then the grand prize is $50,000. One contestant came close to doing that. By the final round, she earned a total amount of $9,400 (multiplied five times), she won $47,000! Players that make it to the final round, but lose their money, still get $1000 from the show for playing. $100, $200, $300. At the end of the round one player gets eliminated. Contestant has the option to wager their winning five times the amount, or wager any other amount against what they’ve earned- very similar to the final round in Jeopardy. They wager this amount before seeing the question and multiple choice answers.